This voucher cannot be used in conjunction with any other voucher. Refer A Friend & Earn £10 with Bulk Powders! Get Up To 40% Off Selected Items In The Bulk Powders Sale! Save Money On Stacks & Bundles with Bulk Powders! Free Next Day UK Delivery On Orders Over £49 with Bulk Powders! 10% Off For All New Customer Orders with Bulk Powders! Having selected a Bulk Powders discount code or voucher you are interested in using, just click on the ‘Get Offer’ or ‘Get Code’ button now to claim your money saving bargain. If it is a discount code, ensure you have copied it by highlighting the text and either pressing Ctrl + C or right-clicking on your mouse and selecting copy. You will now be redirected to the Bulk Powders website where you can shop according to your needs. When you are ready to purchase an item, add it to your basket and proceed to the checkout page. Prior to inputting your banking details, you will be met with an option to include any Bulk Powders discount code or promo code you may have. Make sure you have entered the applicable offer into the ‘Discount codes’ field shown by the red box and red arrow below. 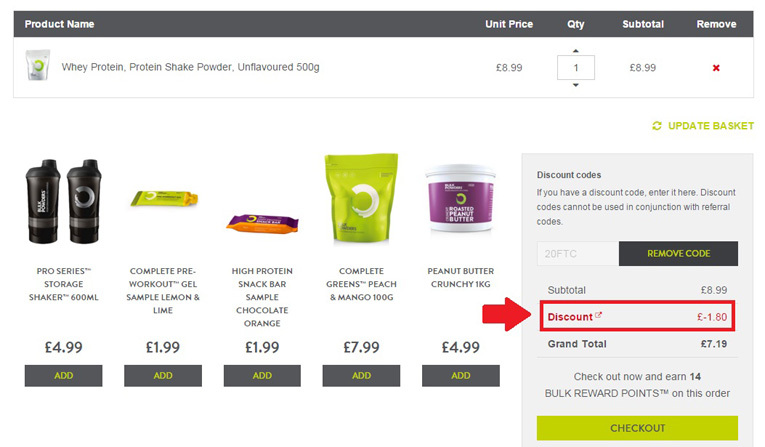 Having then inserted your Bulk Powders discount code and pressed the ‘Apply Code’ button, your discount will be automatically deducted from your order with your new reduced balance now available for processing. Simply hit the ‘Checkout’ button to complete your transaction and enjoy! Remember: Our website is updated on a daily basis, so make sure you are using the highest value Bulk Powders discount code to maximise your savings or you will really be kicking yourself afterwards! 1. The Bulk Powders discount code or deal is in-date. 2. Ensure that you have fully read the attached terms and conditions and that all of the criteria has been met. 3. Double check you are eligible for the discount. Some Bulk Powders discount code offers are only exclusive to new customers so may not work if you are logged into Bulk Powders’ hub and have placed an order in the past. 4. It may sound silly, but ensure the product has been added to your basket first before attempting to apply the Bulk Powders discount code. 5. Make sure the Bulk Powders discount code and voucher has been pasted in or typed in the exact same way as displayed on our website to avoid case sensitivity. If all else fails and you still cannot use the Bulk Powders discount code, voucher or promo deal, email us at: hello@checkmeowt.co.uk and we will be on the case and resolve the issue for you as soon as possible. Bulk Powders are one of the top leading providers for high-quality sports nutrition products in the UK. With the majority of their manufacturing process taking place in-house, Bulk Powders are able to offer you only the best prices available without comprising on quality. This is because all middle intermediaries are cut out allowing you to enjoy your supplements without any hidden charges. The quality of all Bulk Powders supplements and foods lies at the heart of everything they do. Bulk Powders are unique in their distribution of products as they do not continually alternate between suppliers – instead, keeping a tight circle around their relationships providing guilt-free nutritional consistency as well as the best possible prices which cannot be found anywhere else in the UK or Europe! Bulk Powders are also a member of ESSNA (The European Specialist Sports Nutrition Alliance), who are the voice of all sports nutrition specialism in Europe. With a product range spanning from protein, health and well-being, weight loss to whole foods, you are bound to find something that will match your exact requirements at a premier level. Bulk Powders offer some of the finest sports nutrition supplements currently on the market including their cutting-edge Pure Whey Protein™, Elevate™ and Informed Mass®. To date, their best-selling product Pure Whey Protein™, continues to fly off Bulk Powders’ shelves at an alarming rate and it is easy to see why. Sourced from grass-fed cows with a high amino-acid profile and coming in more than 20 flavours, it is little wonder that Bulk Powders continue to revolutionise the health and fitness industry by providing the highest value supplements on the market. Don’t believe us? See for yourself and discover how Bulk Powders can help support you in realising your goals as they continue to support some of the best athletes in the world including high-profile boxer, James DeGale. Having been established for just over 10 years, (starting out in 2005) Bulk Powders have grown immeasurably from being to just another sports supplement company to the most innovative and ground-breaking sports nutrition provider around. Bulk Powders’ no nonsense approach to customer service and overall satisfaction is unmatched compared to the majority of existing brands clocking up an impressive 9.2/10 average rating on Trustpilot. Shopping with Bulk Powders will leave you primed and ready to get the physique you’ve always wanted, the goals you desire the most, but above all, fuel your supplementary needs the way it should be to achieve maximum performance and results. Whether you’re a newbie on the health and fitness scene or a professional athlete, Bulk Powders will never leave you disappointed in the quality and taste of their products, their overall service and the ability to find the supplement you’re after. So why not take full advantage of our special Bulk Powders discount codes and vouchers on our website and begin ‘Revealing Yourself’ today! As well as taking advantage of our great Bulk Powders discount codes and vouchers, it is also a good idea to make full use of Bulk Powders’ loyalty reward scheme – particularly if you’re one to buy in large bulk (pun intended). The Bulk Rewards scheme is designed to help you save more the more you spend. It works in the same way any standard loyalty reward scheme works by allowing you to accumulate ‘Bulk Rewards Points’ on every order you make. This can either be used as a full discount off your next order or can be saved for another time. You will automatically be eligible to begin collecting reward points once you register as a member on the Bulk Powders website. In particular, for every £1 you spend on Bulk Powders products you will earn 2 Bulk Rewards Points where every point is worth 1p in virtual currency. For instance, if you spend £100, you will collect an impressive 200 Bulk Rewards Points totalling £2 in monetary value. 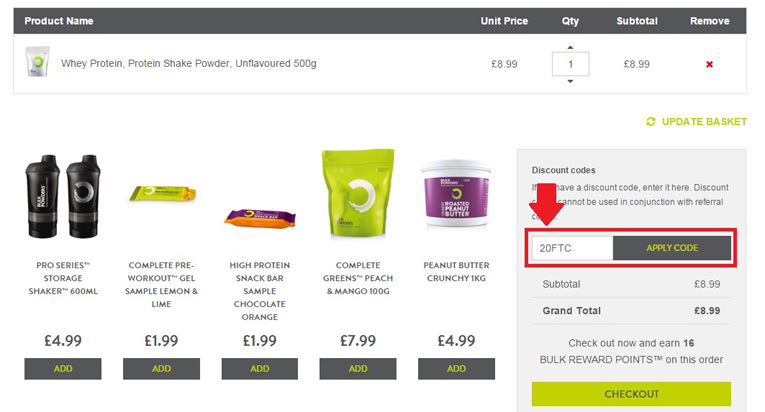 Although this small incentive seems extremely unsexy, it is well worth pointing out that Bulk Powders’ closest competitors – Myprotein and MaxiNutrition do not currently match their double rewards points feature which makes it all the more worthwhile to shop at Bulk Powders! Please bare in mind that the points you have collected are valid for up to one year (365 days) only. If this time has passed and you have not used your points, they will be automatically removed from your account. To check your Bulk Rewards Points balance, simply log into your account or click ‘My Account’ on the top of the website if you are already logged in. From there, you will see a menu on the left hand side of your user account. Click the option ‘BULK REWARDS™’ shown by the red arrow on the left. Bulk Powders also offer a Referral Scheme which allows you to make even more savings on your order, as well as helping your friends and family make significant savings too. 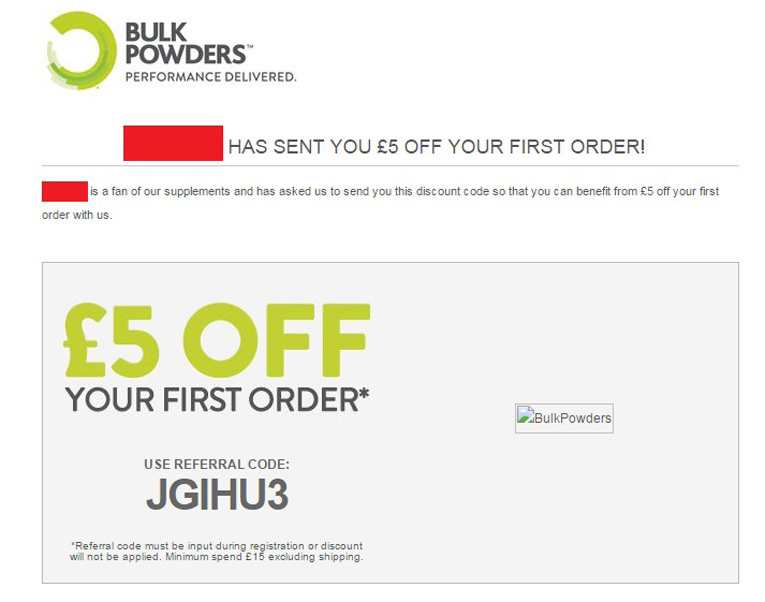 For instance, if you are new to Bulk Powders and have been sent a Bulk Powders referral code from a friend or family member, you will be able to use there code during the registration process to receive £5 off your first order – no strings attached! 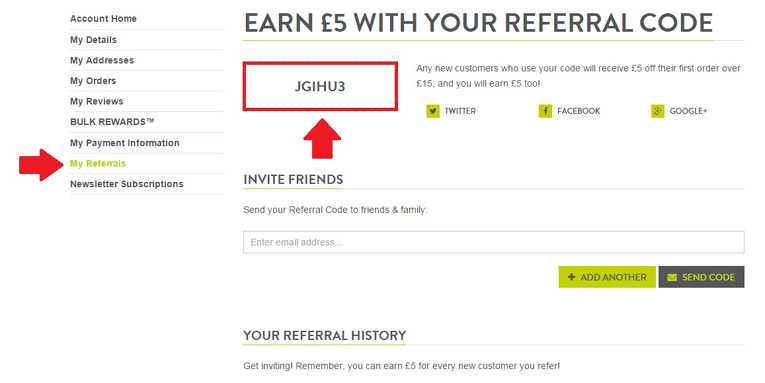 To claim your Bulk Powders referral code, simply register with Bulk Powders with your e-mail address and password. You will then be brought to a new screen where you can fill out all of your personal details. 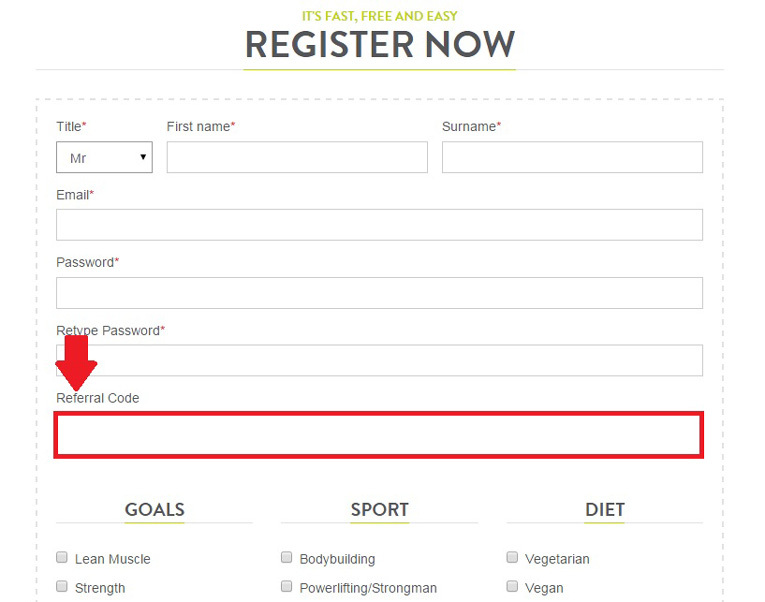 Complete all the required fields as well as inputting your Bulk Powders referral code in the necessary field (shown below by a red arrow). Once you have completed the stage above, shop as you please with Bulk Powders and when you are ready to checkout your items, your Bulk Powders referral code will automatically deduct £5 from your order. Now there’s a reason to give Bulk Powders a try today! Additionally, having registered with Bulk Powders, you, too, will receive a unique Bulk Powders referral code which you can pass along to your friends and family. To refer a friend to Bulk Powders, simply click the ‘My Referrals’ option while you are logged into your account on the left-hand menu (shown by a red arrow). You will then see your special code which you will be able to share with your friends and family (shown in the red box). Next, enter the e-mail of the person you wish to refer for them to receive their £5 money-off discount in the field under the section ‘Invite Friends’. You can also post this code on Facebook or share it on Twitter for all your friends and followers to see, the choice is entirely yours! Although this may be a little long-winded for most, the pay-off can be huge, particularly if you know a group of people interested in Bulk Powders’ cutting-edge sports nutrition supplements. The invited party can now copy and paste this code into the ‘Referral Code’ field during the registration process. As a thank you for your efforts, Bulk Powders will credit you with 500 Bulk Rewards™ Points to the value of £5 which you will be able to claim off your next order! Remember: To be eligible to receive your £5 credit, the referred party must spend £15 or more on their first order (excluding shipping costs). So what are you waiting for? Know a friend who is new to sports supplements, or a seasoned pro looking for the next competitive edge? Get referring today and watch the savings pile up in your favour. 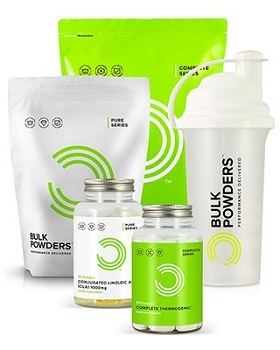 If you are a student and looking to get into great shape, Bulk Powders offer an exclusive 20% off discount across their entire range when you register your student ID with StudentBeans. This is a great way to save some extra money if you are in full or part-time education while working on a tight budget. To get your 20% off student discount, simply follow this link to register your interest for free today. In pursuit of high value, low prices, Bulk Powders offer one of the most competitive rates on the market for delivering your goods to your doorstep. Bulk Powders offer a no frills free standard delivery on all orders over £49 which is £1 cheaper compared to some of their closest competitors. If you are like most people and decide you want to order on a monthly or bi-monthly basis so that you always have enough supplies to keep you on track in the gym, this can work in your favour and save you a fare sum. It is worth noting that this service applies to whether a discount code, referral code or any other money-off incentive is used during the buying process. For any more information on Bulk Powders, or to visit their website click the following link to be redirected to their main page here. If you are keen to find other fantastic ways to save money with Bulk Powders, stay up-to-date with their latest products or to simply familiarise yourself with them as a brand, be sure to sign-up to their mailing list and never miss the latest happenings ever again! To contact Bulk Powders, the best line of communication would be through either of their social media channels which they have an active presence on. This includes the likes of Facebook, Twitter, Instagram, Google+ as well as YouTube. These channels provide an awesome way to be a part of the Bulk Powders community as well as giving you the chance to voice your opinions on anything business or health and fitness related. If your query is specific, your best bet is to contact Bulk Powders directly by submitting a request on their contact form (you do not need to be logged in to your account for this). Bulk Powders contact form can be found here.